There are countless benefits to exercise, no matter what age. 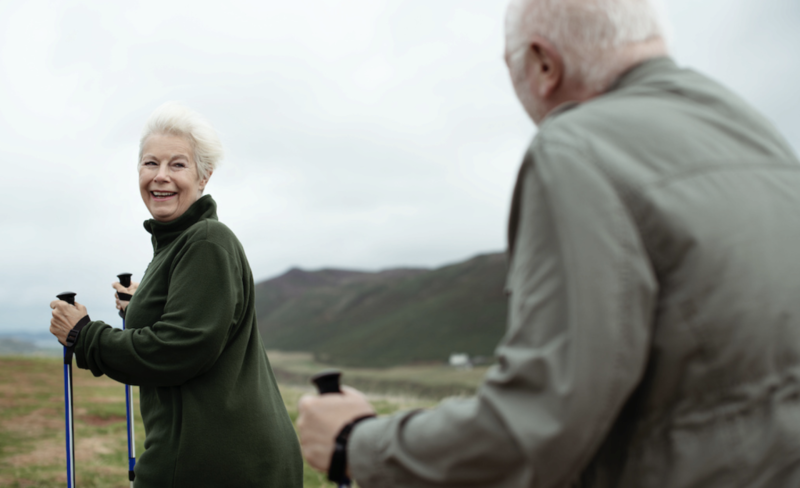 For older adults, many studies point to how exercise is important for the mind and the body. Exercise has been proven to help prevent dementia and keep the mind sharp. Being active is a mood-lifter for people of all ages, but specific studies on elderly patients show that consistent exercise can reduce depression. For those with arthritis, it may be hard to get up and start moving, but regular activity can help alleviate stiffness and keep your joints lubricated. About 12 million seniors – 1 in 4 – live with diabetes, and exercise has been proven helpful in maintaining a healthy body weight and regulating blood glucose levels. Lifelong exercise contributes to cardiovascular and muscle health, too. A recent study from Ball State University shows that seniors who participated in regular exercise for the past five decades have the cardiovascular health of somebody 30 years younger. Its clear exercise is important, but unfortunately, in populations age 75 and older, one in three men and one in two women engage in no physical activity. Federal guidelines recommend two hours and 30 minutes of moderate exercise a week, and that may seem like a lot, but as the saying goes: slow and steady wins the race. The beginning of a new year is the perfect time to set new goals for yourself, such as improving your health with daily walks. Walking is a low-impact, safe method to get your heart pumping daily. It can be hard to start a new routine, especially if you feel achy or tired, but a little exercise every day is better than none at all. Plus, our temperate San Diego winters are the perfect season for daytime walks, providing you with a healthy dose of vitamin D while remaining cool enough to keep you from overheating or getting too much sun. Find a friend. Walking is easier, and safer, with a friend. Setting a walking date can keep you accountable and socially engaged. Visit the mall. Many shopping centers open early to allow walkers to take advantage of the indoor square footage. Or, visit during shopping hours to leisurely browse and people watch as you get some steps in. Most malls have plenty of public seating, providing a respite when you need a break. Join a local health club. If you are unsure of how to start, a local health club is a wonderful option. Professionals can help keep you safe by creating a walking or exercise program to suit your needs. And, most treadmills have handrails to help stabilize yourself while you walk. Go grocery shopping. You may not even realize it but running errands can really rack up the steps! From the car to the store, and from aisle to aisle, running an errand daily is a simple way to get exercise as well as get out and about. Use a shopping cart to help stabilize yourself as you walk – and remember to wear good walking shoes. Volunteer. Finding a volunteer activity can keep you social and physically active. The humane society may need help walking dogs. Volunteering as a local museum docent can give you a chance to help visitors. Here at Serving Seniors we have volunteer opportunities help serve seniors meals, assist in the computer lab or fitness room, and of course leadership positions on our board. Take some laps in the house. If you are housebound, there are ways to still get some daily walking in. Set a timer to remind yourself to get up every thirty minutes and take a lap from room to room. Or, every time you use the restroom, touch each of the four walls of your house before returning to your seat. Small activities can make a big difference in your cardiovascular health, and before long you’ll have more stamina to walk further. For more than two decades, Paul Downey has been a national advocate for low-income seniors, as well as the president and CEO of Serving Seniors, a nonprofit agency dedicated for nearly 50 years to increasing the quality of life for San Diego seniors living in poverty. Learn more at www.servingseniors.org.